After landing in the GROOVY DOOM dimension (otherwise known as 00-D) the field team of RAY STANTZ, PETER VENKMAN, ERIN GILBERT, SAM HAZER and two different KYLIE GRIFFINS are attacked by the HEADLESS HORSEMAN. Using hit-and-run tactics, the Horseman grabs Venkman by the hair and flees into the dark and stormy forest the GHOSTBUSTERS materialized in. It's unknown what the Horseman intends for Venkman -- but his fellow Busters are giving chase! Follow editor @TomWaltz, artist @Dapperpomade and writer @erikburnham on Twitter. 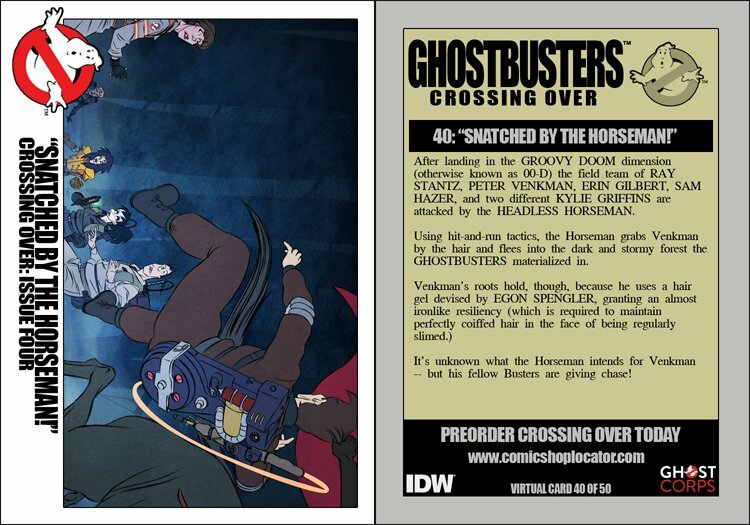 Team IDW Ghostbusters will tweet a brand new trading card every Tuesday and Thursday to RT. As long as your Retweet is public, the card will be added to your collection. @Booyah_Holtz collected Snatched by the Horseman!